Long before natural wine became a ‘category’ in its own right, a few European producers had adopted many of the principles that would become the bedrock of the natural wine ‘movement’. Some of them were quietly making wonderful wines whilst developing something of a cult following. 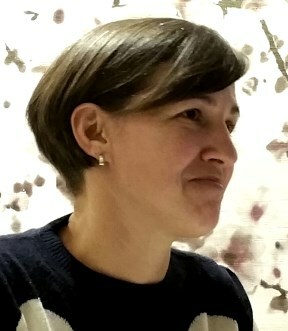 One such producer is Josko Gravner. Back in the early 2000s I was hugely privileged to host Josko’s children, Miha and Jana, when they presented the family’s wines at a masterclass as part of my superBOWL event in Glasgow. The wines were a revelation: subtle but enormously complex, intriguingly dry and austere one minute, revealing floral and exotic hidden depths the next. Quality was superb across the range. I was delighted therefore when Gravner’s importer, Raeburn Fine Wines of Edinburgh, brought another of Josko’s daughters, Mateja, to Scotland, especially when I was invited to a small tasting and wine lunch at Edinburgh’s excellent Castle Terrace restaurant. Having set up business in the family cellars in 1970, the young Josko Gravner began as a very modern winemaker, installing stainless steel tanks, French oak barrels and other equipment which he was convinced were needed to attain the highest level of quality. And indeed, the world agreed, including the award of the ultimate accolade of tre bicchieri from Italy’s wine bible, Gambero Rosso. 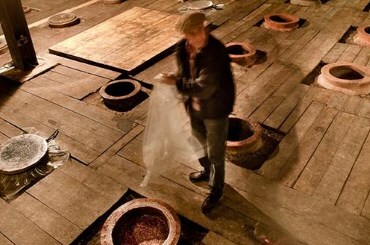 Gravner became interested in the traditional wines of Georgia in the Caucasus, especially their use of amphorae buried underground and used for fermentation, and the very long skin contact given to both red and white wines. He purchased amphorae from Georgia and created a new cellar, where the white wines would be made with five to six months of skin contact, natural yeast, minimal sulphur and from organically farmed vineyards. Mistakes were made in those early days, including the wine seeping away through the clay amphorae, because they had not been lined with wax, but it seems that Josko Gravner had at last reached the place where he and his wines were destined to be. By this time Josko’s son Miha had begun to make the wines with his father. Mateja studied winemaking too, but decided her father was so well-known, and so forceful a character, that she wanted to work elsewhere. So she was working in Verona making Amarone whilst her brother stayed in Friuli. As business grew, Miha asked her to come back and work with him. But their world was turned upside down in 2009 when tragedy struck and 27-year-old Miha was killed in a motorcycle accident. It is largely on white wines that Gravner’s reputation has been cemented. 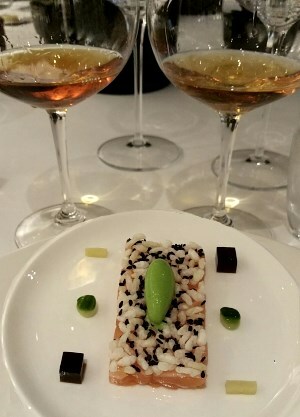 Ribolla, a local grape variety, is clearly the object of the family’s obsession: 2012 will be the last release of their cuvée Bianco Berg, a blend of Sauvignon Blanc, Chardonnay, Pinot Grigio and Riesling, because the vineyards have been grubbed up in favour of planting more Ribolla. But all of the wines are hugely distinctive. The amber-coloured white wines, like those shown above alongside one of Castle Terrace’s exquisite dishes, are never oxidised, never cloudy, but brilliant wines of unfolding elegance and complexity that age remarkably well too. The wines seem to spring from a deeply felt longing of Josko Gravner to simplify and allow his vineyards to speak for themselves. And they speak remarkably clearly. (2016) A touch of ruby almost at the core of the golden, tobacco colour. A little more toffee and richness than the Ribolla 2007, but still that amazing intensity and stunning clarity. There's that salt and meat again, perhaps a slightly broader overall feel, but then the precision and luminosity of the Ribolla is so stunning. (2016) Still very much tobacco/amber colour. An ethereal nose, gentle apple skin and waxy lemon, the subtle chalk and light earth of Botrytis in this vintage. There's a cashmere softness to this but still such a wonderful natural concentration. (2016) There's almost a chocolaty character to this, a little mint and again more breadth than the Ribolla 2006, less of that salt-streaked Fino or Manzanilla dryness. But it has the spark and vitality, with a little zest and flashing juiciness, that is more 'orthodox', but it is beautifully dashing and fine. (2016) From magnum. Delightful amber glow, a deeper colour. There is a light leafiness to this and them that lovely saline freshness . A hint of burnt orange and that intensely dry, concentrated phalanx of acids and earthy, elemental flavours. Hugely introspective, contemplative stuff and still very young. Price quoted is for a magnum. (2016) Sauvignon Blanc makes 40% of the blend along with Chardonnay, Pinot Gris and Riesling. Again chocolate, smoke and a certain richness, with gentle toast before that shocking saline rush of salted lemon, rim of a Margherita thrust of acidity, lemon and salt. (2016) 2003 was first vintage of this red wine after 25 years of growing and experimenting. It spends five years in barrel and five more in bottle, released after 10 years. It is 100% Pignolo, one of four local varieties of red grape. Amazingly dense, youthful colour for a 12-year-old wine. Wonderful inky, dark and meaty red, with a fine, high note to the aromatics of herbs and some floral touches. Made in big, open barrels, the fruit has cherry and ripe red plum. Briar and stalky acidity and grip power the finish. Intriguing and beguiling. (2016) Coffee, cappuccino and caramel flood the nose, a real characteristic of the Breg for me, with immense intensity and characteristic salinity and depths of waxy brown paper, ground coffee and still vital lemon acidity. This was fabulous with the food. Gravner’s wines are imported by Raeburn Fine Wines.